I’ve mentioned before that I have a sick fascination with serial killers and I’m especially interested in the way they think and what made them this way. Were they born to literally kill? Were they taught that killing is a way of life? Were they abused and mistreated then something inside them just snapped one day? 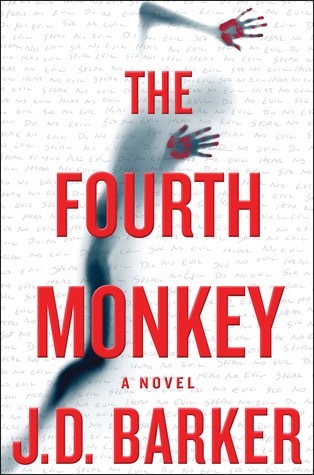 The Fourth Monkey is an insanely creepy look inside the mind of a serial killer with a twist. The FMK actually dies at the very beginning of the book, but he left one last victim for the police to find. She’s hidden away somewhere in Chicago and she doesn’t have long before she dies. Porter has been chasing FMK for years now and he won’t let another young woman die on his watch. He’s forced to follow the breadcrumbs left behind by a sadistic killer, but can he figure out the puzzle before it’s too late? This is told from Sam Porter’s point of view in the present as he tries desperately to outwit a cunningly smart killer and also has chapters from 4MK’s diary. These entries made my skin crawl as much as they transfixed me, it outlines his childhood and shows how he became the monster he is today. Getting a deep look inside the darkest of minds was so scary, 4MK is so emotionless as he describes his horrifying childhood it gave me chills. This was a daring, fearless, in your face read. Barker holds nothing back in terms of his graphic and oftentimes gory descriptions, this is definitely not for the squeamish. I, however loved this approach and even though sometimes the detailed manner in which crime scenes were described was a bit hard to stomach, it really added something dark and sinister to the story. Barker’s writing is fluid and sharp at the same time, it held me tight in it’s menacing grip throughout and weaved some stunning twists and turns along the way. This was a down and dirty, nitty gritty read that was an easy five stars for me, no hesitation. Preorder this one, it’s not available until this summer, but I think it’s one that everyone will be talking about, don’t miss out! Thanks to Houghton Mifflin Harcourt for my review copy. You’ve already read this one? I have it but I was waiting patiently until its release… haha Now I don’t know if I’m gonna be able to wait! Haha I did! Did you get an email invite? They actually preferred an early review. No, I just asked for it They didn’t tell me anything! Well I say read it whenever you feel like it hahahaha!!! If you’re declined let me know and I have an email contact you can use. You need it!! PS- I sent you a DM on twitter. It’s sooo fascinating!! I am surprised that you’re interested though hahaha. I’ll pop over there now.